Three destinations are joining forces this summer to introduce discerning travellers to a new ‘Bermuda Triangle’ of sailing, luxury and lifestyle. The Bermuda Tourism Authority, NYC & Company and Discover Newport announced a joint destination marketing collaboration during a reception at the New York Yacht Club. 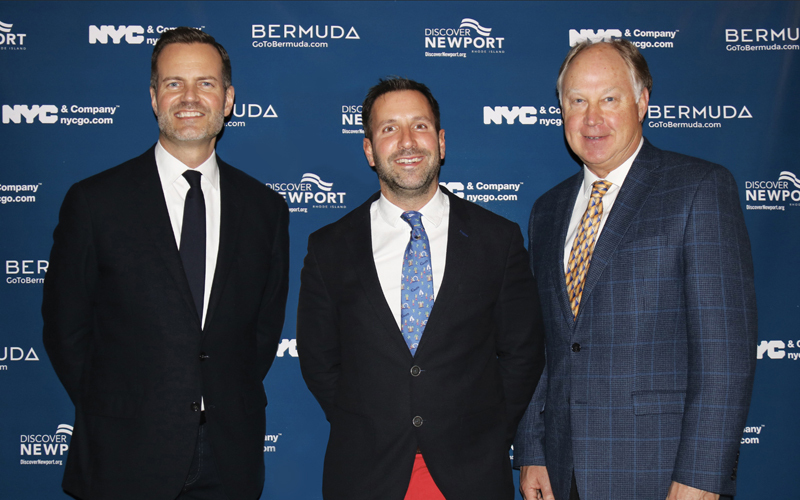 Fred Dixon, President & CEO, NYC & Company; Kevin Dallas, CEO, Bermuda Tourism Authority; and Evan Smith, President & CEO, Discover Newport announced a joint destination marketing collaboration during a reception at the New York Yacht Club on February 7. The announcement said, “The marketing collaborative targets luxury travellers using these premier sailing events as anchors for each destination. Marketing initiatives will include coordinated digital placements, social media, traditional public relations, trip giveaways and out of home advertising. “Considered the Sailing Capital of the World, Newport was synonymous with sailing long before its 53-year run as host to 13 America’s Cup races. Boats have dotted Newport Harbour as far back as the 1750s and today, our deep-water frontage combined with favourable breezes make for one of the finest harbours worldwide, said Evan Smith, CEO of Discover Newport. “It only makes sense to unite with NYC & Company and the Bermuda Tourism Authority as our three destinations share such compelling and intertwined sailing histories, and most importantly, a vibrant sailing future. “Out here, Bermuda has long been a top destination for sailing and luxury. Ideal weather conditions, gorgeous waters, deep connections with the international sailing community, major sailing events and island life are appealing. The island’s legacy of sailing goes back centuries, when Bermuda was founded by the survivors of the shipwrecked Sea Venture in 1609. We also revolutionized sailing by inventing the Bermuda rig, which is still used in 95% of all sailing yachts today,” said Kevin Dallas, CEO of the Bermuda Tourism Authority. The Argo Gold Cup is a long-standing tradition in Bermuda, attracting the world’s best skippers and crews from the match-racing circuit for an iconic event. The fleet competes in International One-Design [IOD] sloops on Hamilton Harbour. In addition to a $100,000 prize purse, sailors are competing for the King Edward VII Gold Cup, one of the most coveted trophies in match racing that dates back to 1907. Organised by the Royal Bermuda Yacht Club, this oceanic race starts from Fort Charlotte Antigua, in association with Antigua Sailing Week. It’s the third edition of the 935 nautical mile race through the Atlantic Ocean to Bermuda. Twenty yachts from seven different countries have already expressed their intention to compete and form a diverse fleet. Several yachts are offering charters, including single berths for sailors who want a memorable experience. SailGP’s global sports league features bold, cutting-edge technology and awe-inspiring sailing. Teams from Australia, China, France, Great Britain, Japan and the United States will battle it out in identical supercharged F50 catamarans, engineered for intense racing at electrifying speeds exceeding 50 knots [nearly 60 mph/100 kph]. The fan-centric, inshore racing will take place on the lower Hudson River, with the onshore Race Village located at Brookfield Place. Friday and Saturday afternoon racing takes place just off the Battery and running north toward Rockefeller Park. The largest multi-class one-design regatta in New England is held each year by Sail Newport, Rhode Island’s Public Sailing Center. An average of 19 classes of one-design sailboats draw sailors from 16 U.S. States and three countries. The Newport Regatta features a wide variety of boats and participating classes include small single-handed dinghy classes up to larger one-design boats that require a dozen crew. Sail Newport provides two to three days of challenging racing and a weekend of shore side events for sailor camaraderie. The event is a “must-do” on the sailing calendar and takes place on the legendary sailing waters of Narragansett Bay which is the historical home of many years of America’s Cup racing and the modern home of dozens of regattas each year. Hosted by the Ida Lewis Yacht Club and the 12 Metre Yacht Club, the World Championship will be the largest-ever gathering of 12 Metre yachts in the United States featuring more than two-dozen boats from seven countries. International teams comprised of elite sailors including America’s Cup veterans and Olympic medalists will represent Australia, Canada, Denmark, Finland, Italy, Norway and the United States.